Football Club Tranquebar has joined the stronger III.12 series and accepted an irresistible challenge to taken on both Mighty Karak Chai FC and Ghungharu FC in the battle for Golden League points, series championship and most of all the battle honour. No one is saying out loud but the intensity is on with Mighty Karak Chai FC being very active on transfer market and Ghungharu FC is expected to do the same very soon. The heat is on and the game will be likewise for real when Mighty Karak Chai FC and Ghungharu FC meet at King Suro Memorial Field in Bihar this sunday. Football Club Tranquebar was challenged to join the series before this season to relive a long time rivalry with both clubs. The offer was too tempting to let go and it is time to set things straight between the three clubs. For seasons the former India Champions Mighty Karak Chai FC has been the best of the three, but lately Tranquebar has been catching up with the team from Bihar. Ghungharu FC has challenged Tranquebar for the top two position in the Tamil Nadu region and if they get the change they want to be the best golden league team in India. From Tharangambadi the message to the opponents this season is loud and clear. Tranquebar is still going for the top spot and a return to II.series, but sees the matches with Mighty Karak Chai FC and Ghungharu FC as more than six points matches with series gold, Golden League success and honour on the line on sundays. Golden League mania has hit India’s III.12 this season and those six matches is must see attractions for all – The hunter has become the hunted. 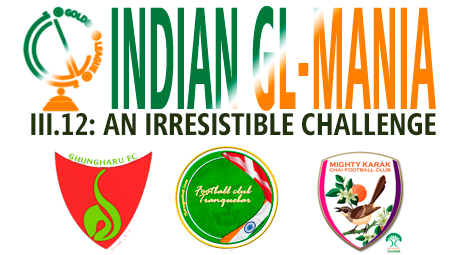 Ghungharu FC has lost all matches against Tranquebar, but the Tharangambadi lions favourite boys haven’t won a match against Mighty Karak Chai FC since september 2014.